There’s an App For That + a Giveaway! I’ve rounded up a few of my favorites and even thrown in a snazzy J. Crew iPhone 4/4s cover to give away! Read through and follow the instructions on the bottom to enter before Sunday, February 12 at 5 PM. This app makes meal planning and grocery shopping easy for people like me. It takes a lot of the daydreaming about what I’m in the mood for or wondering what might be on sale off my plate, so that I can make a grocery run smartly and efficiently. With only a few taps on my iPhone, I can see what the meat specials are for my favorite grocery store, choose one of the app’s pre-loaded recipes or add one of my own (totally not there yet! ), make a grocery list of the items in the recipe, check off what I already have, then stroll through the store with an organized list in hand, crossing off as I go. I love that it takes care of researching the weekly sales and lists the items in order of department / location within the store. I’ve been known to do Google searches like “what aisle are taco shells on” once or twice while I’m in the store. This app is free, which gives you one less excuse to try it out. Even if you’re already super organized when it comes to grocery shopping, I’m sure you can save at least a few minutes using Food on the Table. Download it here or learn more here. Let me start by saying that I’ve only been using this for a week. On the other hand, the fact that I’ve been able to use this for a week speaks volumes. I’m not a runner. I have less than zero extra time to exercise. 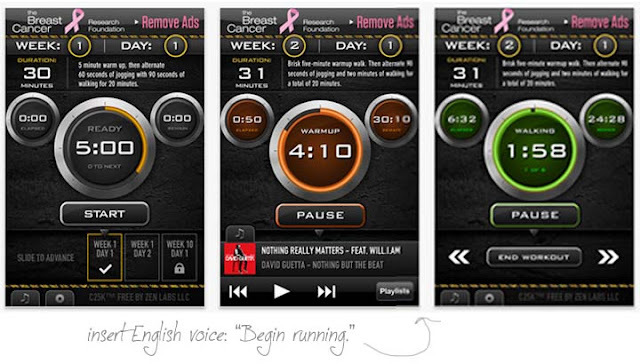 Despite those things, somehow this Couch to 5k app (remember my new year’s resolutions included running a 5k in 2012?) has me actually looking forward to wogging as I call it (walking/jogging) as soon as I get home. The first week was hard, but I’m getting into the routine of it now and I hope I can keep it up. Even with a stop watch, I’m sure I would get lost in my thoughts and forget when to walk or jog. With C25k, I have a pleasant English woman politely commanding: “Begin running” or “Start walking” and I really want to obey. By the end of the eight weeks, I’m supposed to be 5k material. We’ll see, but for now I’m loving it. My obsession with photos plus cool vintage filters, frames and an element of social media sharing? What’s not to love? 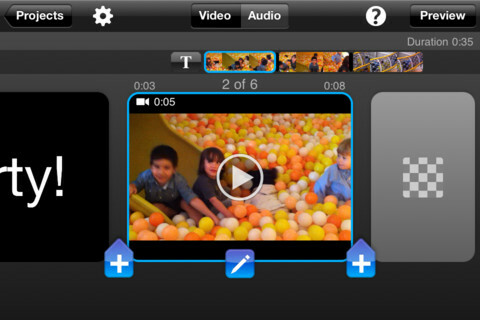 Great for home videos like my sweet Emery’s (almost) first steps or Youtube videos on a more professional level, this app is easy to use allowing trimming, cropping, titles, plus video and audio editing. The design works with the small size of the iPhone screen and I can even add some of the stock effects or music from my iTunes library. Of course, uploading to Facebook, Twitter, Youtube or an email is fast and easy when my videos are done. My little munchkin is just getting to the age where she is fascinated with electronics, sounds that are almost words and anything bright, colorful or noisy. The flash cards in this app range from ABCs to numbers to body parts to food and animals, all with accompanying photos and sounds. I know this is only going to come in more handy as she gets older, but for now she is content to hold the phone and touch the screen a few times to hear the “A is for Apple” sound over and over again. My husband has already proclaimed this the secret to our long, happy marriage. We’ve loaded all of our accounts to bank, credit card and more to keep track of our entire financial picture instead of just one account. I like the bill pay reminders and the way it automatically categorizes spending so we can see just where our money is going. Come on, you know you’ve wondered at least once how it’s possible to have spent your entire paycheck in a mere two days. Not only will Mint tell you, but it will also suggest budgets based on historical spending and send SMS or email reminders when accounts get below a certain point. 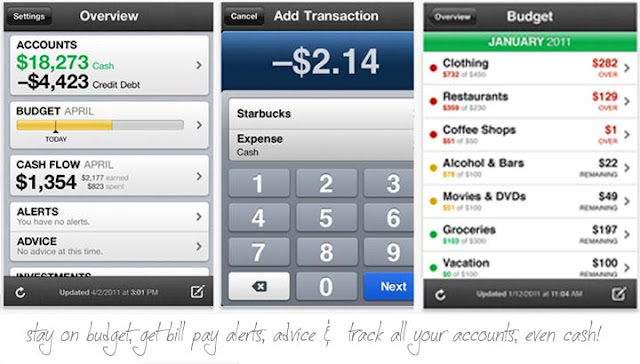 They say PR people go into the PR field because we can’t do math, which makes this whiz app my new best friend. I’m often torn between the instant gratification of shopping in a store versus the selection and price checking benefits of online shopping. 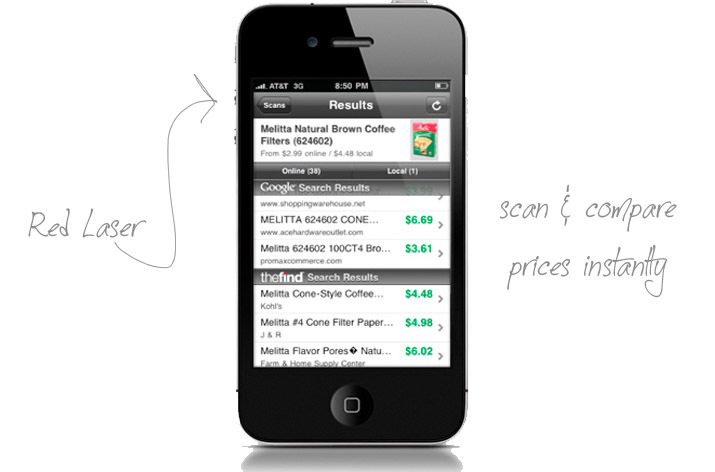 With this, all I have to do is scan the barcode to get a quick list of where else a product is available and at what price. So, if you’re wondering if those fabulous heels you just tried on are on sale elsewhere or if you might find a better deal on those new Ray Bans, scan before you buy and forget about any buyer’s remorse! Learn more and download here. Hmm… Is that grilled chicken sandwich really worse than fish tacos? This app helps me keep track of what I’m eating each day plus how many calories certain foods contain to help me make better decisions. I can also log my exercise (when I have time to actually do some) to keep track of calories I’ve burned, miles ran, etc. I love that I can login on the computer if I’m near one or only using the app if I’m not. Download it here. This is THE app for networkers. Quite literally in a snap, this app lets you type in the details of business cards you’ve received and send an automatic follow-up email to your new acquaintance with a personal message. It has fields for social networks, too, so you can store Facebook, Twitter, and other social handles. How many times have you met a great contact at a networking event or cocktail party and never followed up? This takes the work away and helps you establish email or social communication to stay in touch. It’s wonderful. Download it here. For the girl (or guy) who loves a good list like me and is constantly managing snippets of info. I like to keep track of restaurants or dishes to try on vacation, items I need to research later or a great idea for a blog post, and with Evernote I can attach images or voice recordings to the notes to help me remember. It really keeps track of EVERYTHING! If you can do this as you go, you’ll be so much more organized when it’s time to plan, book or write. Download it here. Are these your favorites? Do you have any apps you can’t live without? For you iPhone 4/4s users, I have a very snazzy giveaway just for you! All you have to do to enter is leave a comment below with the name of your favorite app and why you can’t live without it before Sunday, February 12 at 5 PM CST. One commenter will be chosen at random by random.org and will win this green printed J. Crew iPhone case. See a similar version here. Good luck, happy apping and thanks for reading! 9 Comments on There’s an App For That + a Giveaway! Instagram, is a must for me! Snapping pics with my phone has never been this entertaining and supper easy to share. And now thanks to you my dear friend, Food on the Table is climbing up the list Great post! Definitely instagram – I love taking pics and the ability to add a filter and make them look pretty makes me want to take more! I love the app Around Me. It is especially wonderful when traveling. You type in whatever you are looking for like donuts or womens shoes or rest area..then it gives you directions and even a phone number if it is a business. This app is free and has been a lifesaver for me sooo many time. Love this JCREW case..thanks for the chance! Well living in Seattle has me addicted to my Starbucks app! I’m now a gold status member since June 2011, it allows me to check my balance, see how many stars I need until my free drink, where I can find the nearest Starbucks and if I ever find myself without my card I can pay for my latte with my phone. Hands down my favorite! I love the Pinterest app, because it allows me to feed my addiction to pinning even when I’m on the go! I can’t live without the Angry Birds app and no not for me I have an 18 month old and he is addicted to it. When we are somewhere and I just need him to sit still, I whip that thing out and he is content for awhile. My favorite app is My Fitness Pal! It allows you to track exercise, calories eaten, and calories remaining throughout the day/week/year…. The best part is you can scan the bar code of what you are eating and it will automatically input the ingredients and nutrition information! I haven’t found a bar code that it doesnt recognize yet. I really like Instgram.. It isn’t depressing like facebook!! (unless someone shares an open wound or a dirty unorganized closet). But a “handy” app I just discovered, CardStar is genius!! All of the account/points/perks cards you get from almost any store now can be saved on your phone instead of taking up you’re entire wallet. I have my barcode/accounts saved on this app for cvs, sephora, babies r us, etc! !